banaras ka khana: Zanotta, the fine dining Italian Restaurant at Leela kempinski Gurgaon | a review..
Zanotta, the fine dining Italian Restaurant at Leela kempinski Gurgaon | a review..
All of us Delhi foodies at CAL bloggers table were invited for a review of the fine dining Italian restaurant Zanotta at Leela Kempinski Gurgaon last week. The hotel is prime property joined to the Ambiance mall and when you travel from Delhi to that part of Gurgaon you are always unsure of how much time it will take. We were lucky this time, the day being a Saturday and the traffic just right to reach there within half an hour. I reached on time and within about 15 minutes Deeba also arrived. 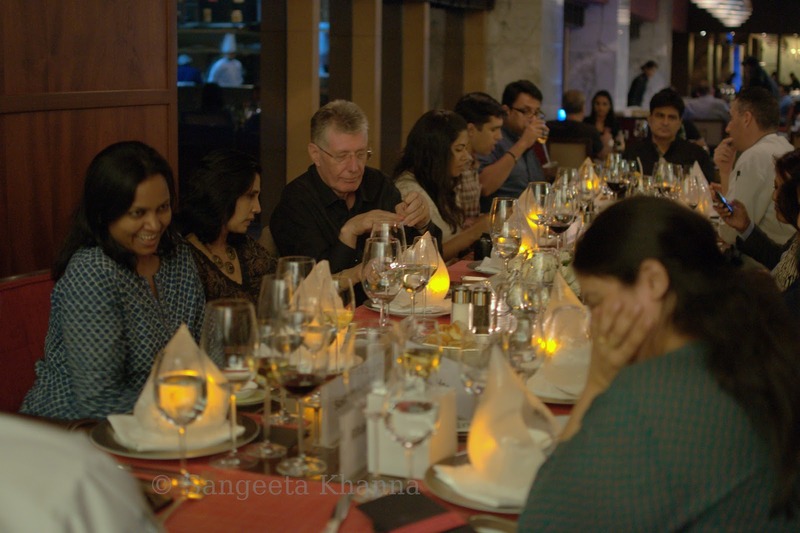 We were welcomed into the Italian restaurant at the sixth floor, with an open kitchen and a private retro lounge overlooking the Delhi-Gurgaon expressway. 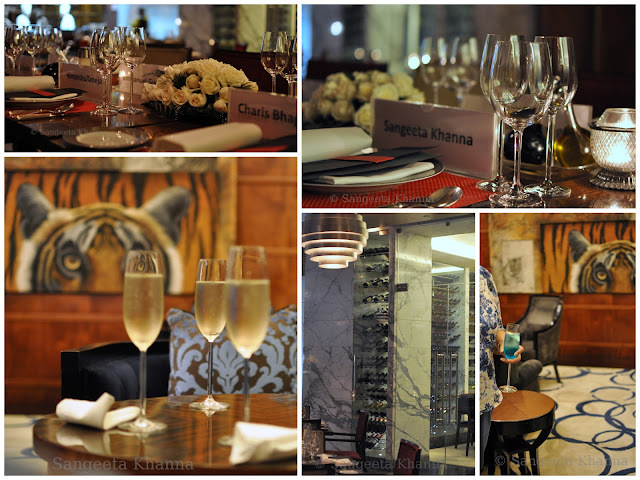 We were greeted by Vinay Narang , the Head of PR and communications, with a welcome drink at the retro lounge. Two sides of glass walls overlooking the expressway and pictures of Tiger eyes on the remaining walls, an interesting vibe this place has..
Wine cellars make the other dividing walls of this restaurant , the decor is very chic modern and stylish. The people manning the restaurant are great to be with, very attentive and very efficient in what they do. In the retro lounge we were joined by Roger Wright and General Manager and Emanuel Guemonl , the Executive Chef along with Shisheer Manohar. Later the celebrity Chef Kunal Kapoor walked in and joined the discussions. We are a talkative lot and we met a talkative lot there as well. Happy. The people make a place special and this was no exception. The food and wines started coming in as we settled in our chairs, Starting with Pan seared Scallops with grilled Zucchini salsa and the wine (Craggy Range, Chardonnay, New Zealand). Good textures of vegetables and Scallops, I wish it was seasoned well too or may be the dressing settles down in a narrow base of a serving bowl like that. I liked it nonetheless. Next was the Sizillia seafood soup. This one I loved with a Mussel that was perfect on top and some shrimps, cubed fish and calamari rings into that smooth tomatoes and olives soup. This was paired with Albert Bichot Cote de Rhone, Chardonnay, France. Next was main course, a mushroom Ravioli which was shaped like Tortellini instead but I loved what was inside. The mushrooms and the soft supple glutinous pasta is my weakness and it was done very nicely.A silky herbed tomato soup and the right amount of cheese. Perfect. It was paired with Valpolicella 'Classico' Allegrini, Corvina Italy. 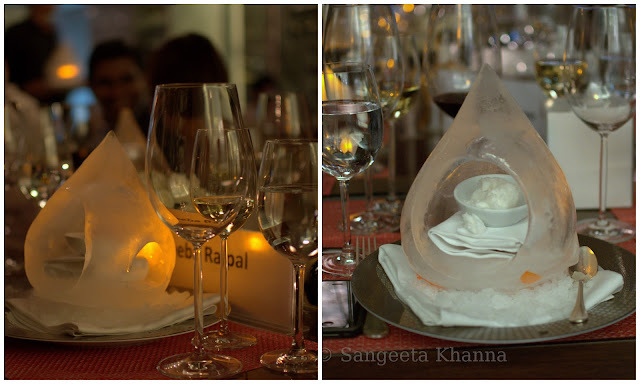 It was a palate cleanser, snugly perched on a seat inside this ice Igloo. A berry sorbet, chilled and refreshing. 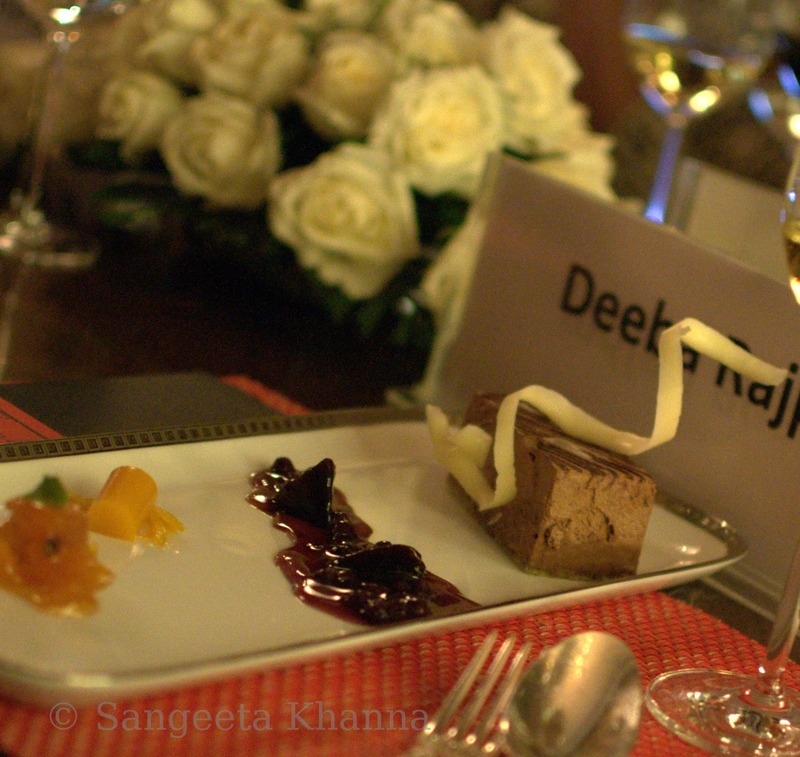 Here is how we all keep chattering on the table. 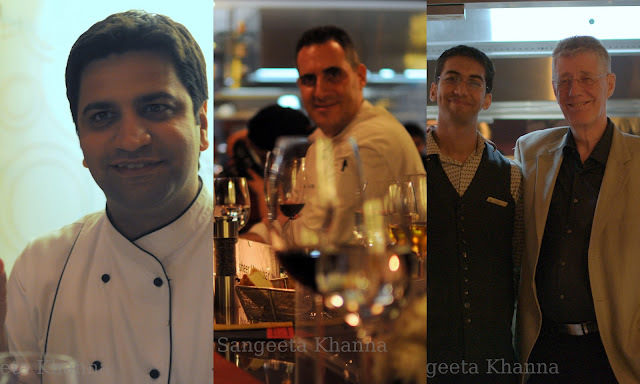 Chef Kunal kapoor ended up asking how long we have known each other. This is called finding the likewise vibes, not measuring friendships by the time. The table is lively and buzzing. The Igloos glowing .. The next main was a Zanotta special Salmon with Arugula pesto. This I was looking forward to. The fish was lovely the pesto deficient. I wished there was a small bowl of pesto on the side. The fish remained under seasoned though it was cooked to perfection with great texture. I loved the greens that came in with it. 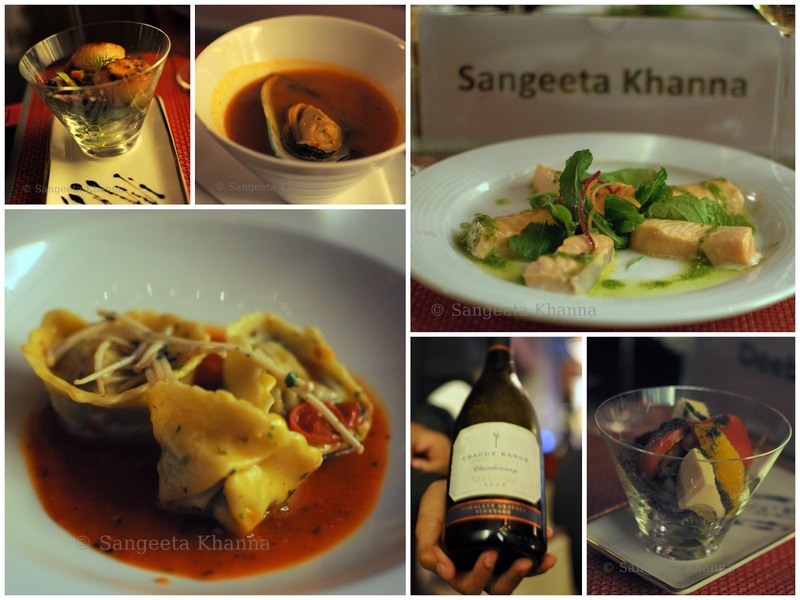 This course was paired with Penfolds Rawson's Retreat, Cabernet Shiraz, Australia. 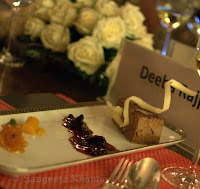 The dessert was a bitter chocolate semifreddo. Nice and goo. Pretty. Loved what it came with. A blueberry coulis, some candied apricots and a tiny piece of mango panacotta with candied orange peel. Bursting with flavors, just the way I like. Fruit on a dessert plate always makes me happy, not much a chocolate person, but all these flavorful fruits complemented the biter chocolate semifreddo very well. 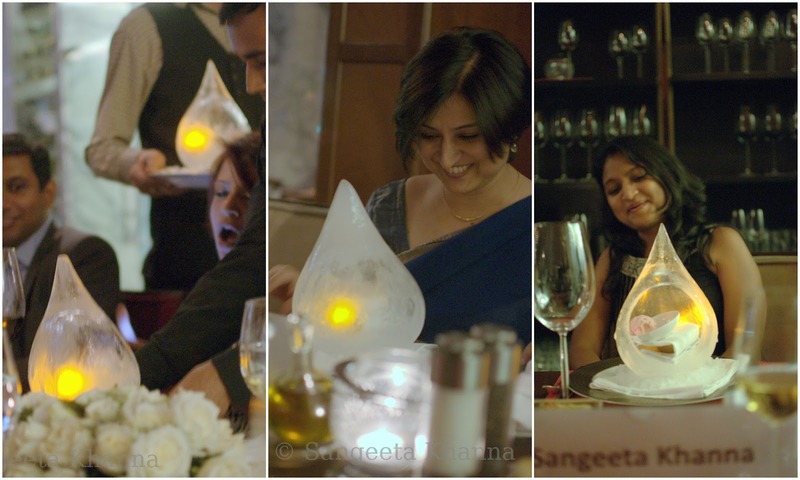 The pleasant interiors of this award winning restaurant Zanotta were cheerful for a large group like ours. The few other patrons were seen enjoying the food and hospitality too, a bit amused by a chattering group on a long table on the side.We spent around four hours without realising the time. Exchanged some garden produce in the end as we do many times, us bloggers, and headed back home without a pig tummy. I love such food. Nice nice review. So wonderful to have such good food memories with such nice company. I love your photographs, especially the one with Vinay, and one in the lounge with the wine glasses and tiger in background. Loved it!